Food Processors! Nema Enclosures NEMA 4X hose down rated 316L stainless steel enclosures protect Vorne Productivity Appliances™ during washdown. 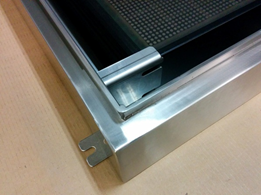 Nema Enclosures protects your Vorne Productivity Appliance investment. 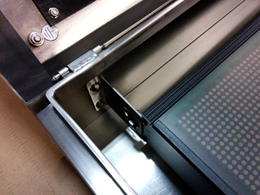 We wrap your sensitive technology in a hose down rated 316L stainless steel enclosure designed to keep the elements out while keeping what’s important inside safe – ensuring that you continue to receive the critical actionable information you need when you need it. 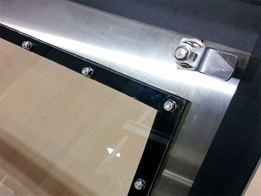 Our enclosures feature a shatterproof window, sealed door, quarter turn latches and concealed hinges. 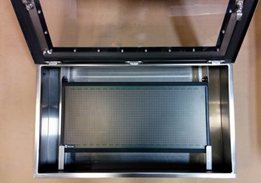 It’s easy to mount anywhere in your facility. NEMA 4 hose down rated enclosures are constructed for either indoor or outdoor use to provide a degree of protection to personnel against access to hazardous parts; to provide a degree of protection of the equipment inside the enclosure against ingress of solid foreign objects (falling dirt and windblown dust); to provide a degree of protection with respect to harmful effects on the equipment due to the ingress of water (rain, sleet, snow, splashing water, and hose directed water); and that will be undamaged by the external formation of ice on the enclosure. 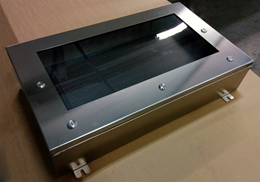 NEMA 4X rated enclosures are constructed with all of the protection of the NEMA 4 rating plus protection against corrosion of the enclosure. Vorne Productivity Appliances provide an economical way to gather actionable information that expose production problem areas fast. Vorne Productivity Appliance in wall mounted Nema Enclosures 4 | 4X hose down rated stainless steel enclosures. Vorne Productivity Appliances also provide a way to inspire and motivate the people that have the greatest impact on productivity – plant floor employees. 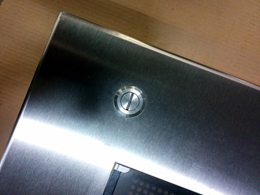 The Vorne Productivity Appliance is a “bolt-on” performance management tool that is so easy to use that it can be self-deployed in about an hour. It automatically tracks production in real-time and instantly delivers meaningful, accurate, and actionable information anywhere in the world. The integrated large area visual display informs, alerts, and motivates plant floor employees, while the built-in Ethernet LAN connection delivers instant production reports and analytics to supervisors and managers. There’s a hose down rated Nema Enclosures enclosure designed for every Vorne Productivity Appliance. They’re easy to order. Simply use the chart below to match your enclosure product number to your productivity appliance model number when ordering. 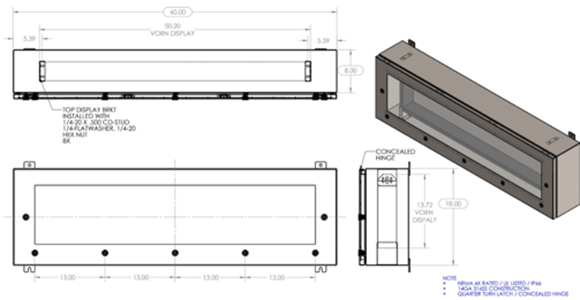 A drawing of a wall mounted Nema Enclosures 4X hose down rated 316L stainless steel enclosure for a Vorne Productivity Appliance. Protect your Vorne Productivity Appliances during wash down in Nema Enclosures hose down rated 316L stainless steel enclosures.